Northwestern Victoria is not quite the great Australian Outback, but damn near it, given the torrid heat of summer - 45+ degees over several consecutive days in January 2019 - the emptiness of the landscapes and the sense of despair encountered in so many once-thriving towns, as they struggle against the odds to keep open the stores, the once-grand pubs, the transport links and the public amenities that once underpinned their viability as sustainable communities. 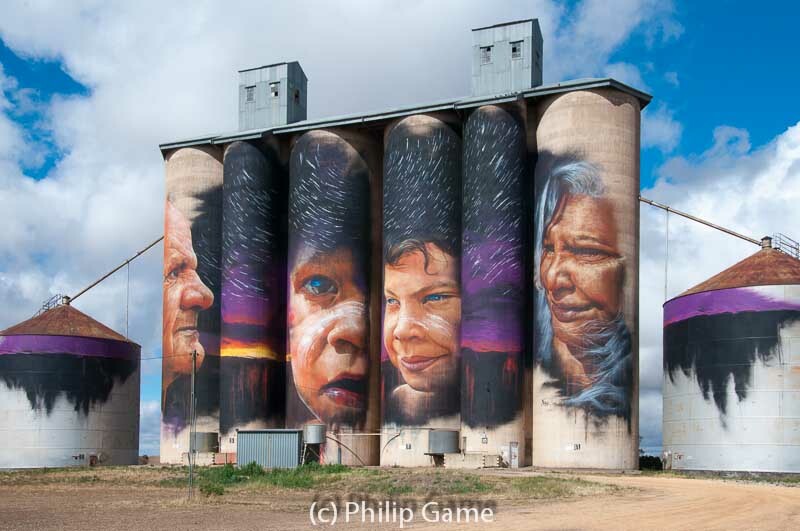 Tourism, the great white hope of so many provincial cities and towns across Australia, has seemed a distant possibility in communities not gifted with tangible attractions: until now, as the silo art movement has taken hold. One by one, whistle-stop communities scattered out along the tracks that carry strings of railcars, laden with grain, distant mills and markets, are flaunting gigantic works of art created on the once-blank walls of towering wheat silos. Street artists, known only by a nom-de-guerre and accustomed to working in seedy downtown alleyways, have won a free hand to adorn these massive blank 'canvasses' with their work. Joining the dots, as it were, creates Silo Art Trails which tempt city-dwellers away from coffee shops and out onto lonely country roads. Somewhat later than my partner's efforts, this gallery begins with images from our recently sally forth into the wheat-growing Wimmera country north of Horsham in western Victoria, Australia. I have also added some much older images from the semi-arid Mallee country, with its striking Pink Lakes, further out to the northwest.